You can’t pass by Los Angeles without stopping for a walk in the sun on Venice Beach. R & I decided to spend the day exploring Venice Beach, he lived there for short while, so he knows his way around. As you arrive there, you instantly get overwhelmed by the number of people there. The Beach front was so overcrowded, I couldn’t take a step without bumping into people. It was crazy. The streets were also crowded with shops, cafes and little kiosks. 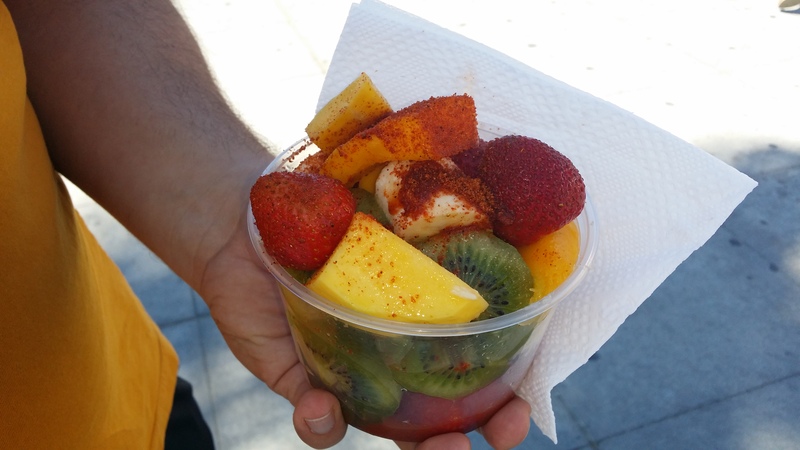 I finally had the chance to taste some Mexican style spicy fruits. And it was delicious! The perfect balance between refreshing and spicy. The sweetness and sourness of the fruits really compliments the hot spices. I can’t wait to try these at home! 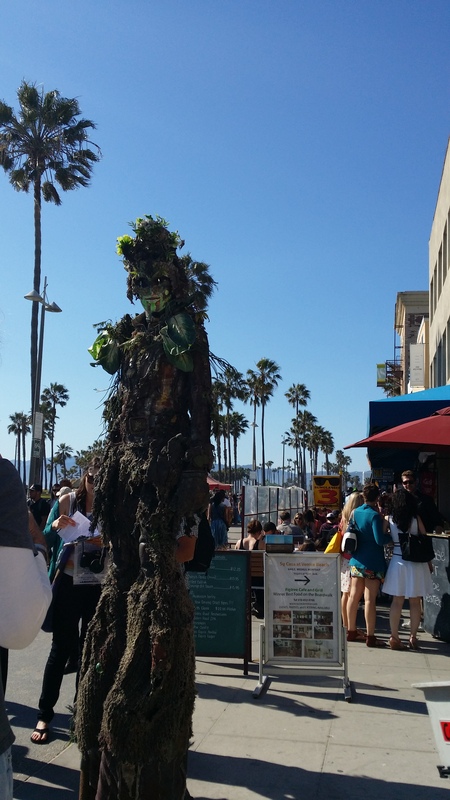 One thing you should know about Venice Beach, it is full with weirdness and it smells like pot. We saw Tree man, a Bob Marley that sings Reggae kids songs,”green” doctors, conspiracy theories paranoid people, cowboys, a lot of hippies and much more. 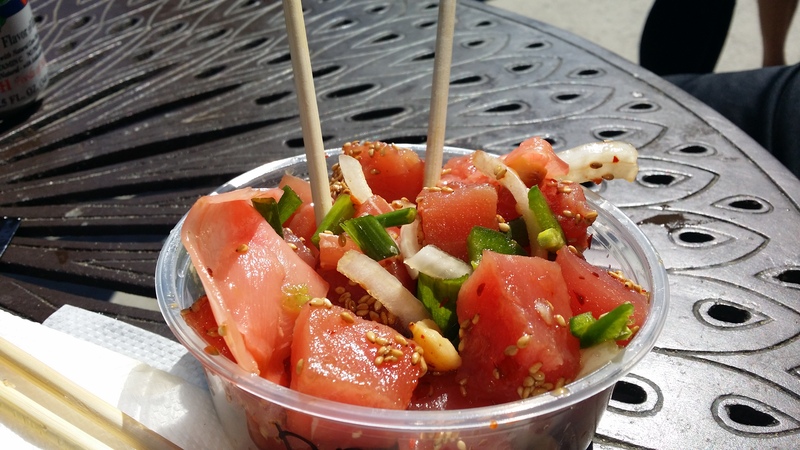 After a quick bite at a poke shack where we had some delicious poke Tuna with onions, spicy green peppers, ginger,sesame and soy, we took a walk on the beach as the sun was setting. On our way back to the hotel, we randomly found the cutest little Mexican restaurant next our hotel. 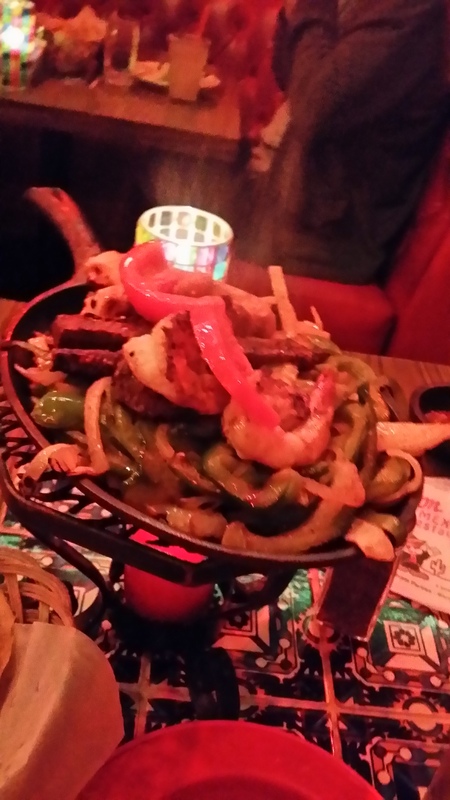 We had a delicious shrimp Fajita and Mexican style spicy rice and beans. Yum! After finishing our meal and having a good time there, we headed to the Westside Comedy Theatre in Santa Monica for a session of improvised comedy by Mission Improvable. Those guys were hilarious! I have never laughed so hard. They were energetic, engaging and so damn funny. Kudos! Check out their website for the upcoming performance www.westsidecomedy.com. Trust me it’s definitely worth a shot. With few drinks there and a lot of laughter, we wrapped our day and headed back to hotel to rest and prepare to the long drive to Vegas the next day. Don’t forget to subscribe to my blog to be the first to read about my all new posts. Stay tuned for some Vegas fun.